This photo was taken at 1:35 on Friday, not long after a tree had fallen on a SEPTA bus traveling west the I-76 near Gladwyne, Montgomery County. Four people were injured in the crash, SEPTA officials said. A Nor'easter dumped snow of varying accumulations across the region on Friday, but it was the wild winds that did much of the damage. The heavy winds – and near-hurricane-force gusts in some places – knocked down trees, poles and power lines across the region. At least 418,000 customers from Chester County to Atlantic City are without electricity late Friday night. The power may be out for several days. A pedestrian crosses the street near the Municipal Services Building in Center CIty Philadelphia on Friday afternoon. 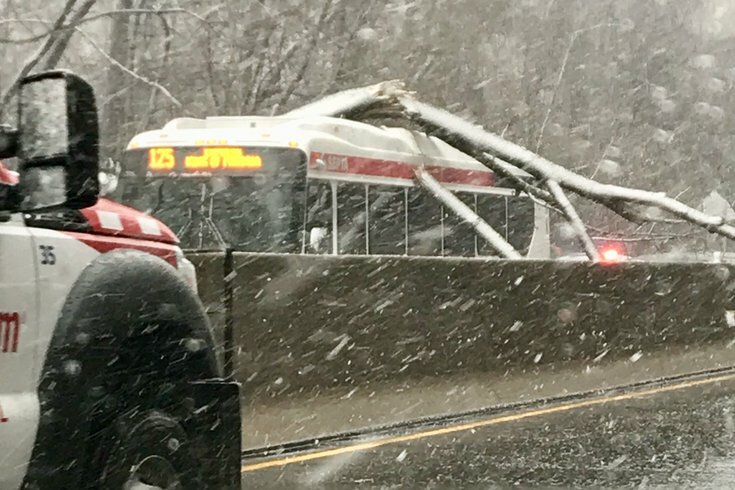 On Friday afternoon, a falling tree struck a SEPTA bus carrying 15 passengers on the Schuylkill Expressway, injuring four people as rain, snow and high winds hit the area. All injuries were minor, SEPTA spokeswoman Heather Redfern said. The transit authority initially reported Friday afternoon that there were no injuries. SEPTA's Route 125 bus, which travels from Center City to King of Prussia and Valley Forge, was headed westbound when it was struck by the tree near Gladwyne around 1:11 p.m., Redfern said. Traffic cam footage showed the tree had fallen from the woods along the highway and was rested on top of the bus, extending all the way into an eastbound lane. All westbound lanes near Gladwyne and the left eastbound lane of I-76 were closed early Friday afternoon. The storm also claimed a 50-foot-tall linden tree in Rittenhouse Square on Friday morning. No one at the park was injured. 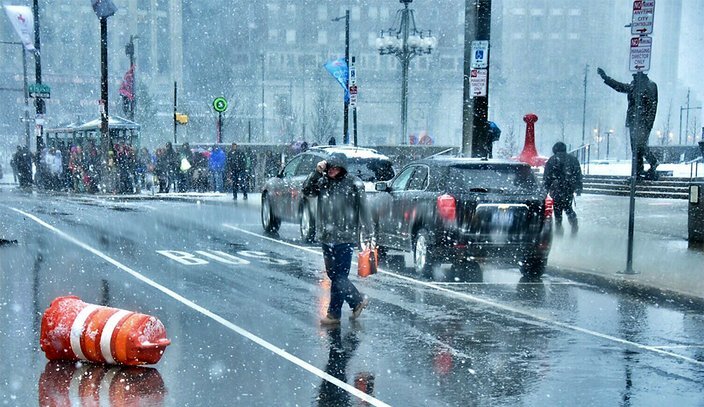 The storm made driving difficult as many commuters saw their ride home take 2 or 3 times longere than usual. It also impacted transit, causing long delays and widespread service cancellations on SEPTA Regional Rail.. The agency announced around 3 p.m. that it had suspended Regional Rail service to Chestnut Hill East, Chestnut Hill West, Cynwyd, Doylestown, Thorndale, Trenton, Warminster, West Trenton and Glenside until further notice because of the inclement weather and power problems. Regional Rail riders headed elsewhere Friday afternoon were facing delays one hour or longer. PATCO riders also experienced delays. Amtrak to suspend its service between Boston and Washington D.C. until Saturday. Despite our best effort to restore service between BOS and WAS today, we have determined at this time it is not safe to do so. Hazardous conditions for our customers & crews have led us to cancel all Amtrak service on the Northeast Corridor until tomorrow. We sincerely apologize. Some municipalities opened warming centers and shelters to assist residents without power. The Lower Makefield Municipal Building in Bucks County is open throughout the night for use as a warming and charging station. In Montgomery County, officials have opened the Keith Valley Middle School, 227 Meetinghouse Road in Horsham as an overnight shelter. The Red Cross of Philadelphia is assisting.